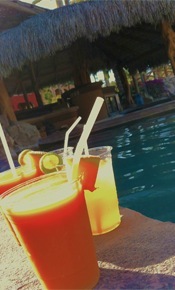 Swim up bars are awesome. Seriously, how cool is it that someone came up with this idea? When it’s sweltering outside, and you just want to relax in the pool, but you’d also like to enjoy a frosty beverage, what do you do? You swim up to the swim-up bar! I think I’d seen one in person before, but I can’t remember where – but I had never had the fantastic experience of actually swimming up to, and ordering a drink from one of these wonderful, wonderful inventions. 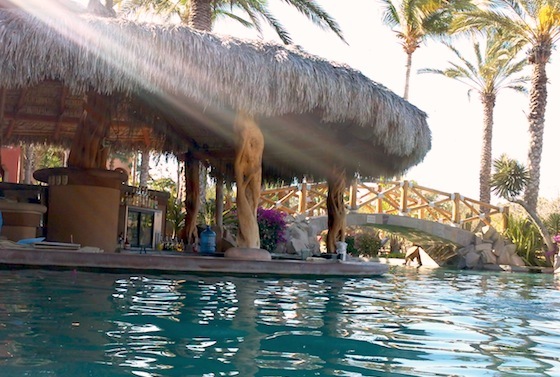 What kind of awesome resort did Maddie find for us – an infinity pool AND a swim up bar?! Maddie, you are my hero. No joke. Maddie and I waded on over, had a seat, and perused the menu. We chose the “Tropical Diamond” which was a frozen drink with mango puree, and a special drink we created for Maddie – kind of an adapted Mojito with pineapple juice instead of the muddled mint and simple syrup. Thanks, Kim for taking pictures of us sitting at the bar! Isn’t that awesome?! 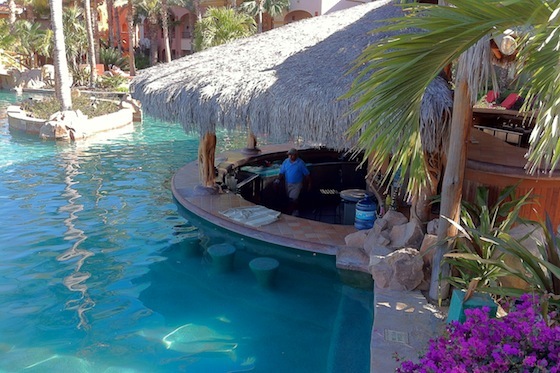 They have bar stools sculpted into the pool floor at the base of the bar so you can hang out, have a seat, and still be in the water! Outstanding! Punny exclamation totally intended! After Maddie snapped the pic of me looking very accomplished, we waded back over to deliver the drinks to the shore. Yay for happy hour! This swim up bar was so cool. I loved the set up and the look – the other half of the bar was above ground, directly behind this setup. This pool, even with the swim up bar, isn’t as popular as the infinity pool (they have poolside service there, too), which means it’s nice if you want to escape the crowds, but for us, it did feel a little weird being almost the only ones there. It probably is pretty neat to see when both sides are all filled up (but that’s totally not our scene anyway). 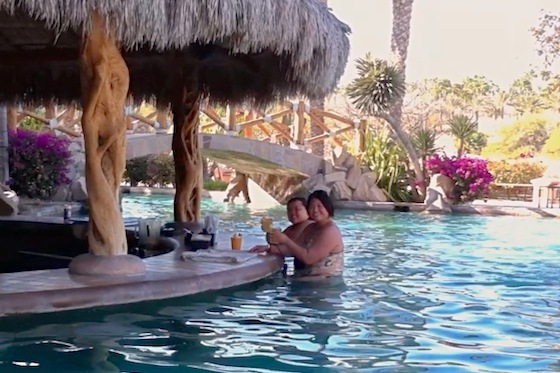 Really though, it was a super cool experience just being able to order a drink without even getting out of the water … or rather, getting into the water just to order a drink!